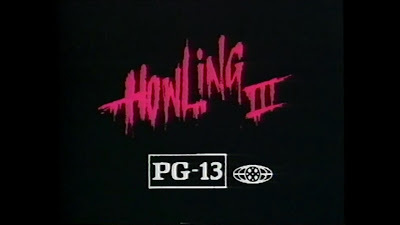 The third film in The Howling franchise is absolutely one of my favorites of the series, it was a staple of basic cable in the 80s and 90s, so I grew up on this film. 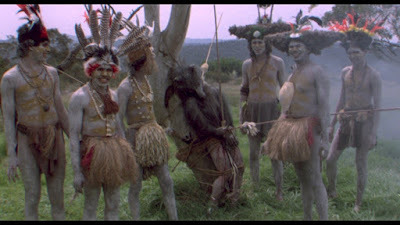 It's lycan movie unlike any other, about an Australian strain of the hairy beast descended from the long extinct Tasmanian Tiger, and being from Australia you just know they had to be marsupials as well! 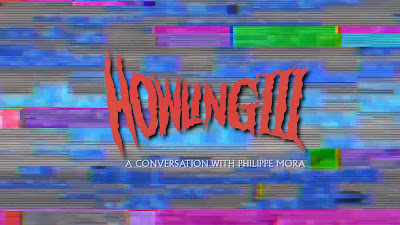 The film is directed by Phillipe Mora (The Best Within) who also directed the fairly awful The Howling II: You're Sister is A Werewolf, for this third film he went full on ozploitation, filming in Australia with a largely Aussie cast, making a full-tilt weird slice of werewolf movie making the likes of which the world has never seen before, or since. We have a lost tribe of marsupial werewolves living in the rural outback, but government agents have now aware of their existence and are tracking them with orders to exterminate on site. 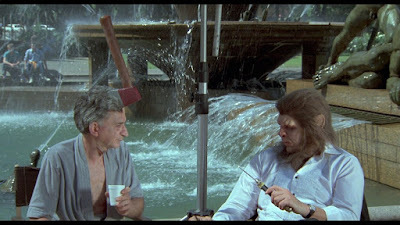 We have a sympathetic American scientist Harry Beckmeyer (Barry Otto, The Punisher) working with the government, plus a gorgeous teen aged lycan named Jerboa (Imogen Annesley, Queen of the Damned) on the run from her abusive stepfather Thylo (Max Fairchild), the leader of their werewolf clan. 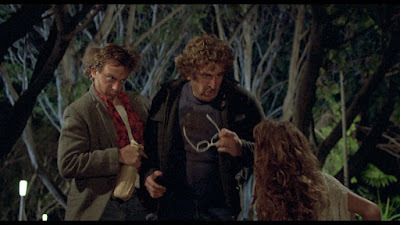 While on the run she encounters American teenager Donny Martin (Leigh Biolos) who is in the city filming a horror movie with director Jack Citron (Frank Thring, Mad Dog Morgan, catching the director's eye, who casts her in his latest film, a cheesy werewolf film titled Shape Shifters Part 8. Jerboa and Donny begin to fall in love while filming, with she admitting to Donny that she is a werewolf, though he doesn't believe her, though when he finds her fur-lined marsupial pouch while she sleeps he starts to comes around to the idea. 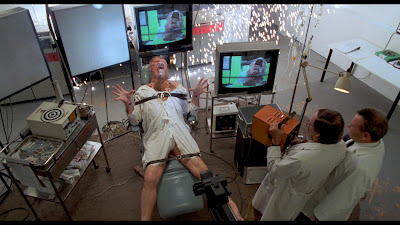 Later at the movie premiere of the movie a strobing light at the party causes her to accidentally begin to turn, she flees the party but is hit by a car, ending up in the hospital where doctors discover her lycanthropic secret and marsupial pouch. 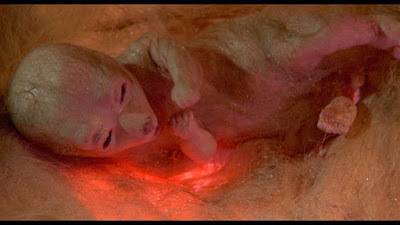 They keep her their against her will for observation, also noting that she is pregnant with Donny's child. 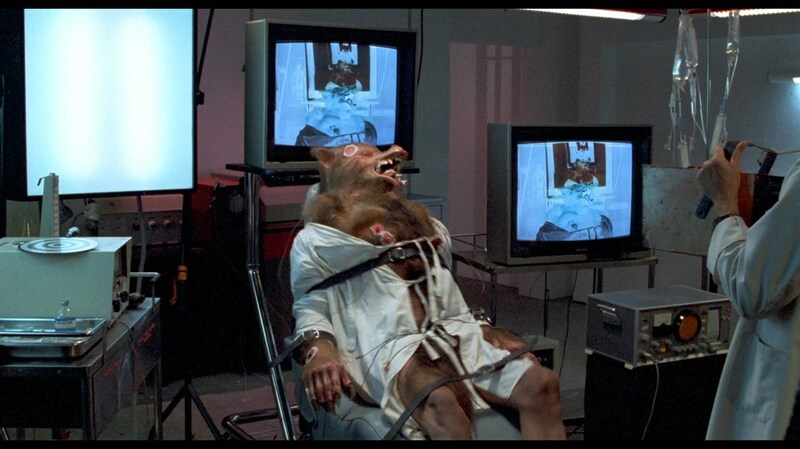 Meanwhile her abusive stepfather Thylo has dispatched three of his lycan clan to return Jerboa to the clan, three female werewolves disguised as nuns, who eventually make their way to the hospital where she is being kept and free her, spilling a lot of blood in the process. It's a strange film indeed, and then we have Professor Beckmeyer falling in love with a Russian dancer name Olga (Dagmar Bláhová) who is a werewolf, changing allegiances and running off with her to have their own child. 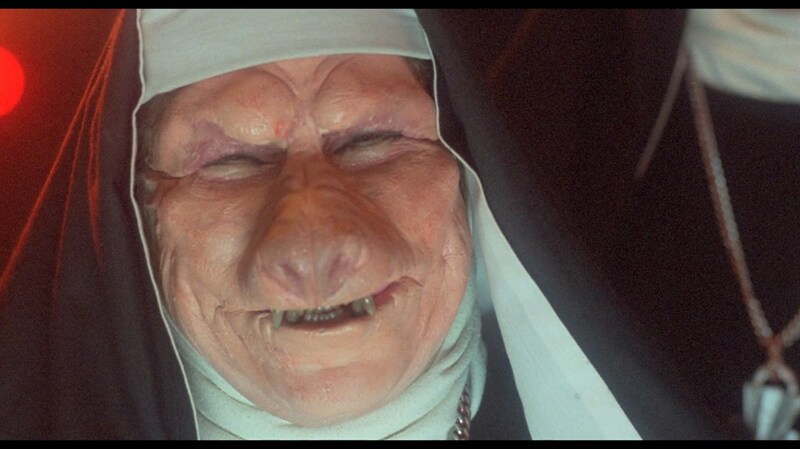 Bláhová has a very unique face, wide eyes and and even wider Cheshire grin that is just creepy, but not as creepy as the werewolf nuns! 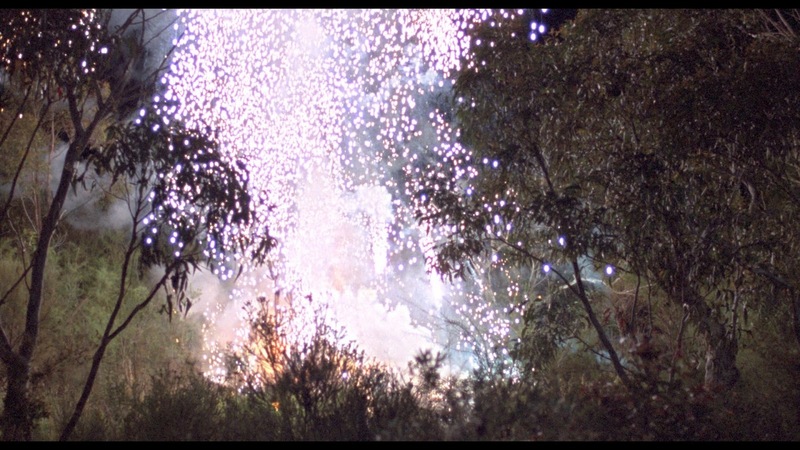 Eventually we have the government agents tracking the werewolves back to Thylo's compound, in the village of Flow - you know, Wolf spelled backwards (ugh) - launching an assault and taking Thylo prisoner. He eventually escapes after being tortured, praying to the gods to transformed into a giant wolf, which he does. The big beast savages the government soldiers, but is only seen in a fleeting glimpse before being blown to smithereens by a rocket launcher! I've seen this film so many times, on TV and on home video, but I always seem to forget the epilogue involving the Hollywood career of Jerboa and Donny, their teenage son and reunion with Beckmeyer, plus a Golden Globe awards type show that mirrors the ending of the first film, sort of. 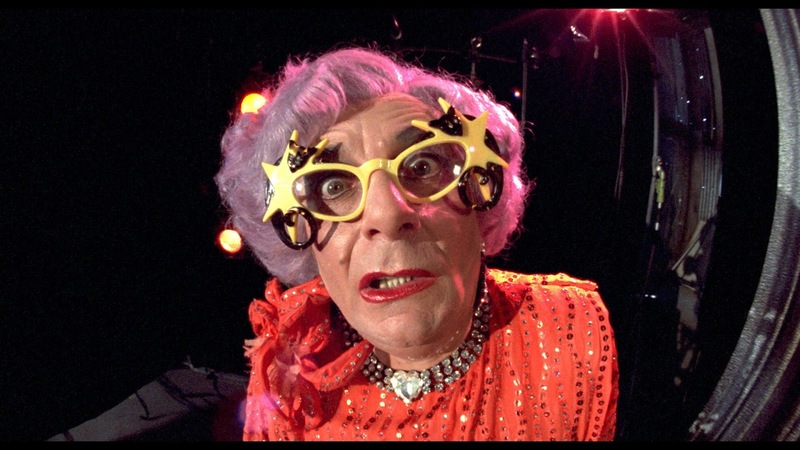 This scene features ozploitation legend Barry Humphries as his character Dame Edna presenting at the awards, making this one of the most Aussie movies ever. I love the weirdness of this one, there' so much about it that makes so very little sense, but it moves fast and is hugely entertaining. 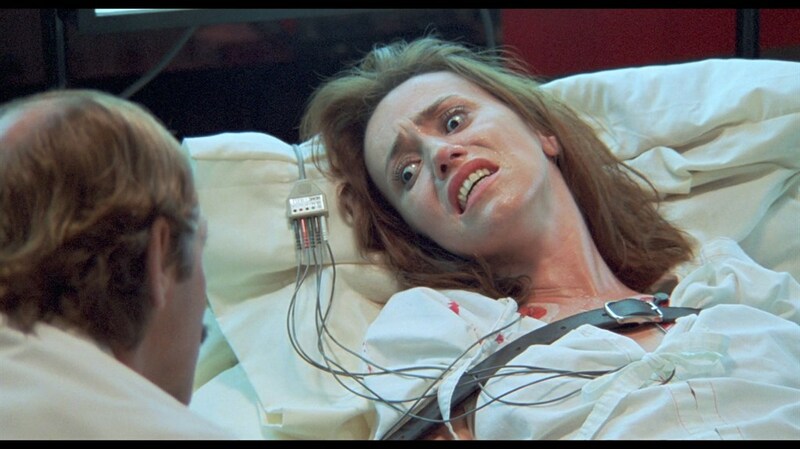 I'm not sure why there's a scene paying homage to the chest-burster scene from Alien but there it is! 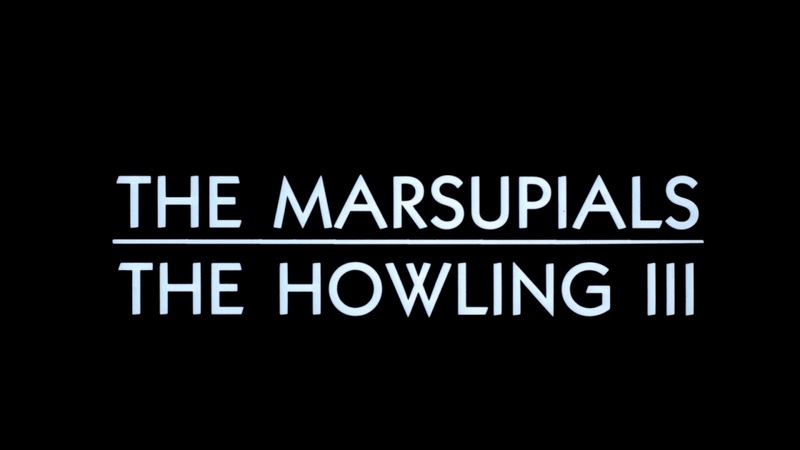 On top of that you get the marsupial birth of a werewolf baby, plus aboriginal actor Burnham Burnham (Dark Age) as a ferocious Tasmanian Tiger striped werewolf - which is pretty darn cool! 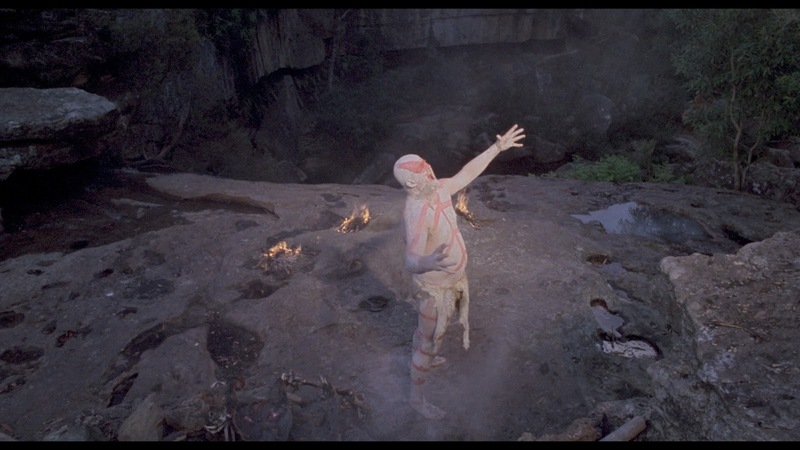 Audio/Video: Howling III arrives on Blu-ray from Scream Factory with a new 4K transfer sourced from the OCN, sponsored by The National Film And Sound Archive Of Australia, presented in 1080p HD and framed in 1.85:1 widescreen. The image is a bit soft in places, grain is well-managed but can be obtrusive in a few of the darker scenes. The colors are warm and natural looking, and the blacks look just fine, everything looking crisp with good clarity. Audio comes by way of an English DTS-HD MA 2.0 stereo, a dynamic and well-balanced track that offers up good stereo separation throughout, optional English subtitles are provided. 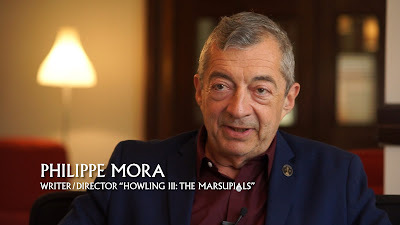 Onto the extras, which are very Mora-centric, we begin with an audio commentary with Writer/Director Philippe Mora, Moderated By Filmmaker Jamie Blanks. I had the old Elite DVD for a while, it also contained a commentary with Mora, but I no longer have it for comparison, but according to the press materials this is a new commentary from the director, it mirrors a lot of what is touched on in the interviews in the disc, but is a great track just the same. 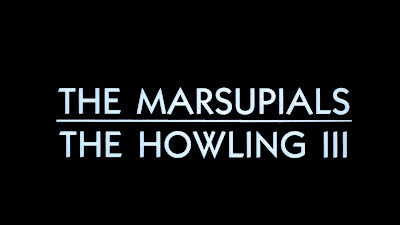 The 27-min interview with the directors has him speaking of how he was inspired by the vintage black and white footage of the now extinct Tasmanian Toger. 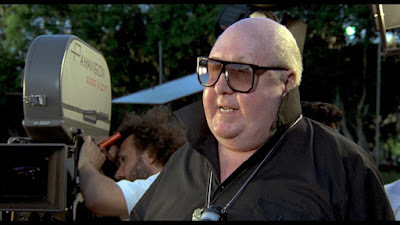 We also get about 17-min of interview footage with the director and special make-up FX artist Bob McCarron from the Not Quite Hollywood! ozploitation doc, and a 2-min trailer for the film. 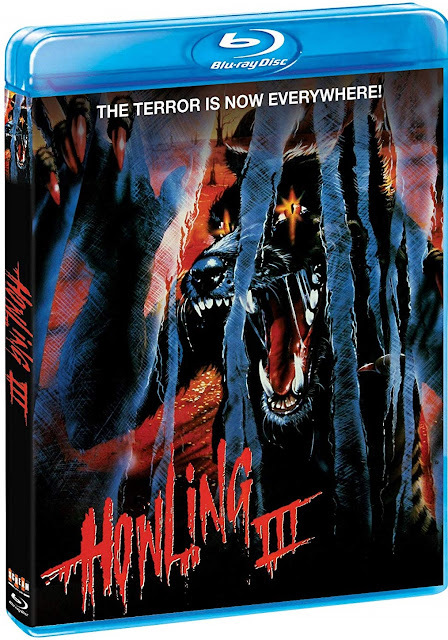 The single-disc release comes housed in a standard Blu-ray keepcase with sleeve of artwork featuring an image from he film on teh reverse side, the disc itself also features the same key art, which is the original illustrated artwork that has been featured on previous VHS and DVD releases. Howling III is a gonzo ozploitation version of a werewolf film, it's never boring but it also doesn't make a lot of sense. 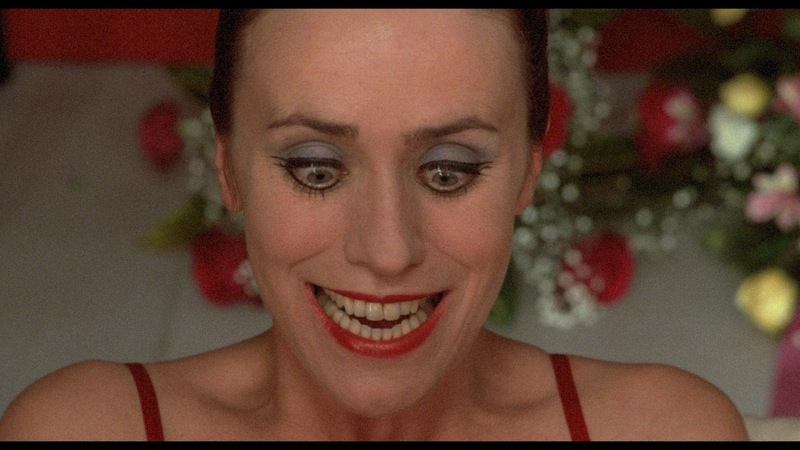 It's almost like a nightmare, the kind where you cannot quite recall how you transitioned from one strange scene to the next. It has a hallucinatory dream logic about it that I just dig a bunch. 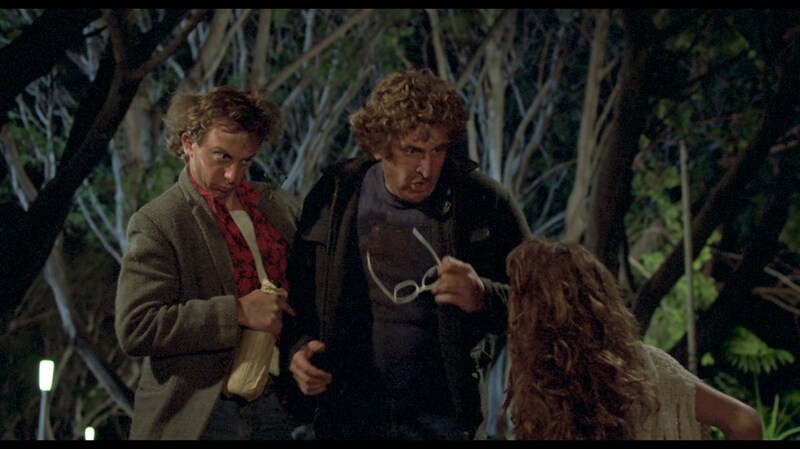 That's not to say it's a great horror film, it ain't, but it's a demented watch that doesn't skimp on the strange. About the only thing I don't care for is that we don't get a real satisfying werewolf transformation in the whole dang film, we get loads of cool looking werewolves with neat marsupial trappings, but never do get a wholly satisfying transformation, which for a typical werewolf film would spell certain death, but this ain't your average werewolf film, nope, not by a long shot, and that's why I love it.